Part 1: Overwhelmed by setbacks as she pursues her academic ambitions, Tricia Hersey discovers an unexpected solution to her stress. 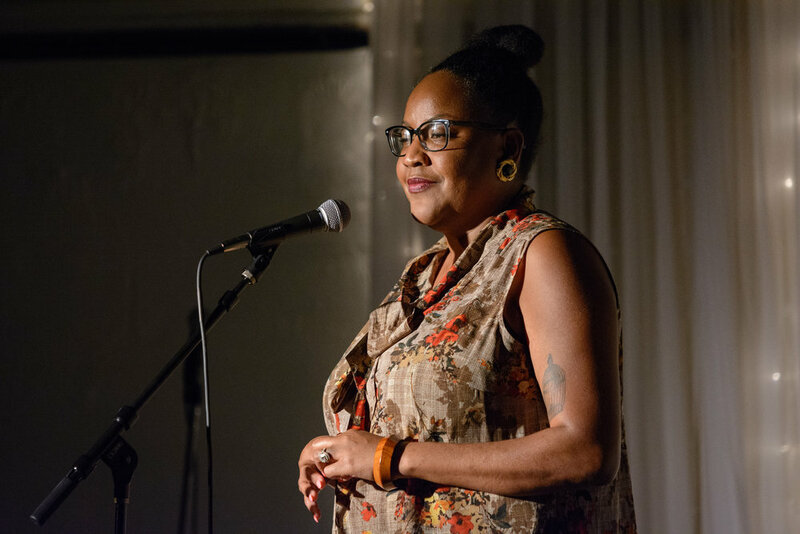 Tricia Hersey is a Chicago native living in Atlanta with over 20 years experience working with communities as a teaching artist, poet, performance artist and community activist. She believes impromptu spectacles and site specific installations can bring awareness to social justice issues that paralyze our communities. Tricia has research interests that include black liberation theology, womanism and somatics. Her work has been seen with Chicago Public Schools, Chicago Park District, Columbia College Chicago, Steppenwolf Theatre, United States Peace Corps and Google Chicago. Tricia has a Bachelor of Science in Public Health from Eastern Illinois University and a Master of Divinity from the Candler School of Theology at Emory University. Her current project is The Nap Ministry, a community installation that examines that liberating power of rest by curating safe spaces for community to nap together. Part 2: Evolutionary biologist Sarah Hird's first pregnancy becomes a crisis in her scientific faith when doctors warn her that there may be something severely wrong with her baby. Sarah Hird is an Assistant Professor in Molecular and Cell Biology at the University of Connecticut. Her primary research interest is in how the microbiome has interacted with avian evolution. What role have microbes played in bird diversification and does this role differ from other major branches on the tree of life? She is also interested in how we can diversify and democratize the STEM fields and Academia. Dr. Hird holds a Master’s degree from the University of Idaho and a PhD from Louisiana State University. She was a Chancellor’s Postdoctoral Fellow at the University of California Davis. So I landed in Atlanta from Chicago in 2010. My husband’s job transferred us and I didn’t know a soul. I was a new mom of a three-year-old little boy and I had all these big dreams of continuing my art career and also going to graduate school. I always wanted my masters degree. See, I’m the first person in my entire family to go to college. Both sets of my grandparents barely finishing elementary school as refugees from white terrorism in the Jim Crow segregated south of Mississippi and Louisiana. My parents further instilled this love of education in me even though they were both high school graduates. My father always wanted to go to college. He wanted to study film. But his dreams were deferred at 19 when he took a job at Union Pacific Railroad so that he could care for his wife and his child on the way. So education for my family was really a tool for liberation so I always wanted to go to get my masters degree. It was a pull to fulfill my ancestors’ dream and also this love of curiosity of learning that I had so it stayed on my yearly list of goals. It was a huge accomplishment for my entire family when I graduated at 22 with my Bachelor of Science in Public Health. At my graduation, my dad squashed me so tight that I thought that I will crack open. Going to graduate school remained even though money and time and opportunity got in the way. So I was here in Atlanta so I decided to just apply and look at all the schools here. I did research, I thought about writing, education programs, theater. I went to all of the big open houses, I went and I felt okay but not really excited. Tricia Hersey shares her story on the Story Collider stage at the Highland Inn and Ballroom in Atlanta, GA in October 2018. Photo by Rob Felt. I landed one day on the website of Emory University. I was there specifically to research their Creative Writing Program but instead I landed on the home page of the Candler School of Theology. I know. And I couldn’t leave. I read very tab, clicked every link, looked at every picture and I just kept falling deeper into this rabbit hole. It was as if there was this divine intervention pulling me to apply for a Master of Divinity when I really didn’t know what theology was. See, I’m a poet, performance artist, community activist but I was raised in a church my entire life. My father was a Pentecostal, Holy Ghost-preaching, fire-and-brimstone, Holy Ghost-catch-them-falling-out pastor and elder of the Church of God in Christ. I remember watching people in my father’s congregation fall out and catch the Holy Ghost and truly embody worship as a way to liberation. And my mother went to labor with me in Sunday school. She stayed for the lesson then went to the hospital. So I know about church but I went to church because my parents took me, so at 18 when I went away to undergrad, I was done. I never looked back. And here I am, 20 years later, about to apply to one of the top seminaries in the country because it just felt like the right thing to do. I felt like it was some spiritual longing. So I clicked the link on the online application and I applied and I waited. While I waited, I took part-time jobs in retail to kind of make ends meet. I was working at this really fancy, high-end chocolate boutique in Buckhead and I was bored out of my mind. I remember being in front of the counter arranging all the delicate chocolates and then my cell phone rang and I ran to it. I was finally going to graduate school and I felt like I was floating on air. And I continued floating through the weeks, I floated myself all the way to the Candler’s New Student Orientation and I was so hyped and I was so ready. Then I floated into the first week of classes and then the pace felt so rigorous. The writing style was foreign to me and I felt unseen and I felt unheard and inadequate. And I felt unseen in the sea of white classmates who would stay very silent whenever we began to talk about slavery and racism in the church. And I would listen to lectures and I wondered why we were centering European history when I knew that the ancient foundation of Christianity was in North Africa. And one day I got the nerve to raise my hand in my History of Christian Thought class and I wanted to ask the teacher why we were using inaccurate maps of Egypt, and he didn’t even look up. My heart sank. I felt humiliated in the sea of 200 people in the lecture hall. Then there were the outside forces went on me daily also. Eric Garner was just murdered by the police. The Black Lives Matter Movement was heating up and there was a constant loop of police brutality on videos and online and everywhere I looked and I was scared. And two of my really close family members died suddenly and I continued to feel unseen. Months later, I was walking home from school in the parking lot with my son, we were walking through the parking lot of a gas station near my house around 4:00 p.m. and I felt a tug on my shoulder. I looked and I saw a young man running with my book bag with the strength of an Olympic track star. In my bag were three expensive textbooks on Liberation Theology, my jump drive that contained every single lecture note from every single class, twelve classes, all my research projects over 100 documents. And also a journal with my handwritten sermon, my first sermon ever that I was scheduled to preach in two days. I cried all night and I was numb and disgusted. I wanted to quit school that day and in this moment of clarity, I decided to pray to get some peace. After I prayed I just kept repeating, “Tricia, do not stop school. Keep going. Keep going.” And so I kept going. That’s actually all I really did. I physically just kept going. I totally had mentally checked out. I did nothing in class. I literally would get to school, get to class, get the attendance credit and then go take a nap. And it felt so good. It felt so good to rest and nap and I napped all over that campus. I napped under a tree in the quad and I napped in this atrium. They had this comfy little chair. It was perfect. I also napped in the new Psychology Building. They had couches set up. I napped on the dance floor after a ballet class, I napped at the library, upstairs in the library, I napped downstairs in the library, in the archives of the library. And my favorite place to nap was in Cannon Chapel. I knew the worship schedules so I will go on the off days when no one was there and I would climb all the way up to the balcony. It was my favorite place to nap, right up top. They had these long pews that were actually upholstered so I could stretch my long body out and I can go deep into a sleep. I could get it and I went down. And it just felt so healing. It just felt like the right thing to do. So I would set my alarm on my phone for thirty minutes and I will stretch and I will go deep into this healing portal. And one day, while I was just getting right into that moment, I hear the loud noise of this beautiful pipe organ playing. As soon as the first chord played, I jumped up and screamed. There was someone there, a musician who was actually rehearsing for a recital. He didn’t know I was there. I didn’t know he was there so I was so embarrassed. I picked up my book bag and I scurried away. And during this season of napping, I was enrolled in the class called Cultural Trauma. In it we learnt about all these groups all over the world who were experiencing trauma and how they could ultimately heal from it. And I had the pleasure of doing a research project on Jim Crow survivors and I interviewed them and many talked about how trauma was held in their bodies. This led me on to research articles about sleep deprivation actually affects our bodies. And I found this beautiful article about how, when we sleep, our bodies and mind actually help us heal. And I just was obsessed. I just kept researching and I kept napping. And I read this beautiful article that said when we sleep, our brain is actually bathed in a chemical that helps us to forget trauma. And I was empowered to sleep more. I was now sleeping from an empowered state. And I just kept resting and sleeping and then I kept getting better grades and I started to be inspired. I actually started to make connections between faith and spirituality and the science of sleep and I just kept going deeper. So I started a community organization called The Nap Ministry and we examined the liberating power of naps. We installed and curate safe spaces for the community to nap together all over Atlanta and all over Chicago, and we rest together and we nap. And I kept sleeping, of course. I kept napping and I was inspired. The naps saved me. Thank you. In June of 2013, I was driving across the desert southwest with my husband. It was a miserable car ride. It was 115 degrees outside the car, it was probably 95 degrees inside the car, and the whole car smelled like hot dog breath because our black dog was in the black backseat of our black car overheating and stressed out and very not-subtly hating us for doing this to her. But I couldn’t have been happier. We were moving from Louisiana to California because both my husband and I had just earned PhDs at Louisiana State University and we had both landed great jobs, postdocs, in two great labs at the same great university, University of California, Davis. Sarah Hird shares her story on the Story Collider stage at Real Art Ways in Hartford, CT in October 2018. Photo by Nick Caito. The cherry on the top of my perfect life was that I was five months pregnant with our first child, a big healthy baby boy we nicknamed Bubba. She then told us that the baby was big, we knew that, but that his head was too big and his kidneys were way too big and that these two symptoms were consistent with a lot of terrible genetic disorders that ranged in severity from mild cognitive delay to severe mental and physical disability to death within the first year of life to stillbirth. I was taking notes. I understood the words she was saying, like ‘chromosomal deletion’. I’m a biologist. I knew what those words meant but I was very confused because our son was healthy. And she said, “Yes, we think he does.” So there was a ‘we’. Over the next three months, I had 24 doctors’ appointments. They checked his heart. They checked that his kidneys and bladder were functioning. They monitored his size and looked for physical deformities. We saw a genetics counselor who ordered some tests for my husband and this appointment was most memorable because, on our way out the door, she says to us, “If you want to do something, it’s too late for California. You have to go to New Mexico,” casually telling us to cross state lines if we want to abort Bubba. I was crushed. I’m a scientist. I know what those words mean, ‘confident’, ‘very confident’, ‘true finding’. That meant that they had irrefutable data. It meant that they had robust conclusions based on evidence. And it meant that any other doctor who looked at our file would draw the exact same conclusions. It also, to me, wasn’t just a woman giving me her opinion, it was a scientist backed by a team of scientists. It might as well have been science itself telling me that, statistically, we had no hope. During this time, I emotionally shut down. We had just moved. We didn’t know anybody. I didn’t have any friends. We didn’t have any family in the area. I had my husband, thankfully, who was going through all of this by my side and for himself, and he dealt with it by working a few extra hours and reading medical literature. He's also a biologist so he was reading about kidney problems and head sizes and he was able to convince himself that we did have hope, that the doctors could be wrong. But I was having none of that. I read one time on a website for families with children with disabilities that sometimes you have to grieve the child you thought you were going to get in order to accept the one that you did get. So I spent my time just holed up in this emotional bunker doing just that. I killed and grieved a healthy baby and the life I thought we were going to get to make room for our real son. So this meant violently rejecting any happy thought that popped into my stupid head. The image of teaching him to drive or high school graduation, learning to read, would he look more like me or my husband, even changing a diaper I stopped as soon as I realized I was thinking about it. But because we didn’t have a diagnosis I didn’t know what to make room for. So I sat in my bunker and just visualized as vividly as I could all the potential futures before us. What did mild cognitive delay look like? Maybe a tutor. Maybe he lives at home his whole life. What if it was physical disability? What if he couldn’t walk, talk? What if he couldn’t swallow or feed himself or use the bathroom? Would he be in pain? Would he be developed enough to know that other kids were making fun of him? I weighed the pros and cons of stillbirth and I wondered what would happen to my marriage. I didn’t have a baby shower of any form because I couldn’t pretend to be happy about anything. I didn’t buy a single piece of baby clothes because I wasn’t sure I would have someone to put in them. And I stopped talking to him. It had been that when I felt him move the first time in the morning I would say, “Good morning, Bubba.” He whacked me real good in the bladder I'd say, “Oh, you're getting so strong, Bubba.” But for a while he would kick me and I wouldn’t say hello back. My due date approached. They said he was probably ten or ten-and-a-half pounds and they were pretty sure that his head was too big to come out of me, so we scheduled a C-section. Never felt a contraction. We just showed up to the hospital at the appointed time. C-sections are not fun. I was awake from about the sternum up thanks to a large needle in my spine. The room was very cold and it was full of people I didn’t know. It was a teaching hospital so there were a bunch of people in the room all wearing pale green scrubs, the sea foam-colored ones. There was silence for somewhere between half-a-second and a million years. And then he cried. They wrapped him up and they brought him over to me, put him real close to my face. I wasn’t wearing my glasses, so he was right there and he was purple and he was scrunched up and he was weird looking. He was screaming and covered in crud. My next thought was, “Get him away from me and get him to a doctor,” which is what they did. I didn’t say that out loud. My husband went with him. I’m lying there on the table by myself, violently shivering at this point, and I’m wondering how long it will be before we have a diagnosis. How long before we know for sure who our real son is. I don't know what I said to her about that. Maybe, “Thank you.” I don't know. My son Cormac was nine-and-a-half pounds when he was born and his head was in the 99.999, I don't know how many nines, percentile for size. He didn’t have to go to the intensive care unit right away or anything, so the first time he saw a pediatrician was in our shared hospital room about 12 hours after he was born. And this woman saw the bunker. She was warm and kind to us. She says, “Okay, let’s take a look,” and she examines our son. Obviously, I don't believe her because that can’t be possible. She comes back the next day and she says she read our file. She measures my head and she measures my husband’s head, and she offers to be our pediatrician when we get out of the hospital, which we accept. About 60 hours after we left our house to go to the hospital, we return with a possibly healthy baby? I didn’t know what to do. This wasn’t how it was supposed to go. We were supposed to be visiting him in a hospital incubator or something. What the hell do you do with a baby? So we go to the doctor the next week thinking, surely, this is the time that they will find the symptom that is indicative of the disease they were sure he had. Now, he turns five at the end of this month and he just started kindergarten. He's a tall kid. He's a heavy kid. He has a big but mostly proportional head. He's hit all his developmental milestones. His kidneys are fine. He's happy and outgoing and he's bright in every sense of the word. He loves making people smile and he really wants to be funny. But he's not funny. Because he's four and he writes his own material and every punch line has the word ‘poop’ in it. So what happened? I don't know. I don't know if the big head I noticed basically everyday is because there's a critical error in my son’s genome that makes him at a higher risk for pediatric cancer or if the big head I see every day is because his dad is 6’4” and also has a big head. I wonder if they even know that he seems healthy. I wonder if they ever followed-up or thought about him. I wonder if they ever thought about me, because I have certainly thought of them many, many times in the past five years. I will remember some of their words forever. And I wonder if they know about bunkers. My bunker is still inside me and part of me is still inside the bunker. I know this is true because every time, literally every time in the past five years when I start to complain or feel sorry for myself for any of the many daily unpleasantries that come with parenting, anytime I start to complain about dealing with bodily fluids or rearranging my schedule again or being woken up at just the right spot in the sleep cycle where it hurts to open your eyes and I go, “Oh, my God, this is the worst,” a voice in the back of my head clears her throat. Driving across Arizona, I knew my son was healthy. Living in California, I knew I was going to watch him die. Now, I see him every day and I don't know anything. Thank you.